Noemi Laurente-Siegrist, a citizen and long time resident of Switzerland, came back home and built a beautiful house at the very spot she was born and raised in Suba, Danao City. 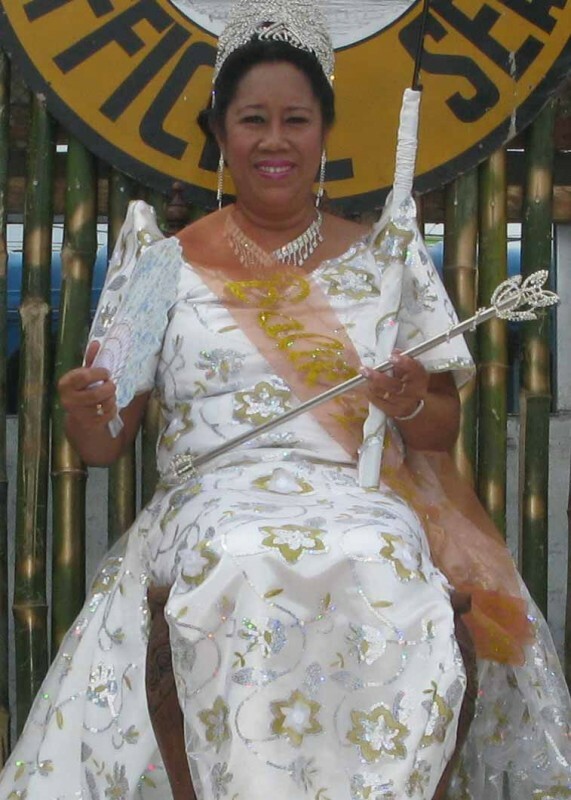 She was approached a year ago to be Reyna Elena 2009 for the City Fiesta celebration in Danao City; Noemi Laurente-Seigrist, a longtime resident and citizen of Switzerland, knowing it was for a good cause readily agreed and made a commitment to come back. A month prior to the fiesta Noemi called inquiring if she could mail to the DAUSA treasurer her donation to the Santo Tomas Parish Church for her participation on the Reyna Elena fund raising pageant. We advised her to give it personally to the President of the Pastoral Council upon arrival in Danao. A week later our DAUSA liaison in Danao, Ms. Jade Batucan, relayed a message from the Pastoral Council stating that the church would not sponsor any longer or get itself involved in Reyna Elena pageant. Upon our arrival and during the Balik-Danao Welcome Lunch we learned that in lieu of the Reyna Elena fund raising event, the Balik-Danao Queen pageant would once again be held during the Balik-Danao Nite and the committee had convinced Noemi to participate telling her the proceeds would be go to the Fiesta Committees various projects. Ms. Seigrist agreed and even volunteered to have her beautiful daughter, a belly dancer and instructor in Switzerland, to perform at the event. Two other DAUSA members were gracious enough to play along and join the Balik-Danao Queen at the Balik-Danao Nite, Crosine Roble of Long Beach and Becky Mercado of Temecula, California. Expectedly, the Swiss easily won as the 2009 Balik-Danao Queen and the audience at the Danao Civic Center got a double treat with an awesome performance of a real professional belly dancer, by Naomis daughter Lucijah, holding the audience so quite and breathless to the end. I wanted to write more about Noemi, but I havent talked to her much on a more personal level, digging more into her family life, her struggles, how and why she ended up into that beautiful country. To be on the safe side and not dishing out wrong information, I asked Dr. Jackson to write what she knew about our friend from Switzerland because she had hanged out with Naemi more than me. I first noticed Noemi during one of our post mission lunches in Tita and Sani’s Guinacot farm, when Noemi served my husband Ben some food, drink and dessert while I was taking care of myself and not looking after my husband who was foreign to our customs at that time. Right after the 2006 Medical Mission she went to Bohol with us for our Church wedding and made sure that she had pictures with Ben and me. She has been misunderstood as having flirted with some doctors. Poor Noemi! She is just caring to people, who she feels are deserving of her attention. patient whose BP was extremely high (220/130) who I wanted to start medications right away and was observed and rechecked before he left. She gave her a year-supply of Ramipril. While not yet sure if she would win, she heeded to my advice to go to Ricky’s house and have her measurements taken for a gown. Darling and I were sneaking to the restroom behind the stage so we can check if Noemi wins. It took a little while to count the money; so we waited. As soon as the canvassing was over, I approached Mr. Toledo. He pointed to Siegrist of the tally sheet as the winner. Darling and I immediately pulled her out from the waiting area and helped her change to her “instant” beautiful gown for the coronation. Then she went with me to Tagbilaran to deliver the medications left from the mission for the Botika sa Katawhan of which the Tagbilaran Association of California is a major supporter. It was during this trip to Tagbilaran where I knew more of Noemi. She is married to Herbert, a Swiss guy, who loves to visit the Philippines. In Switzerland at her employment, she was chosen to train to make delicate life-saving cardiac-related things like artificial heart valves. This is a special God-given gift! I learned that she is a great wife and mother. She gave and is still giving the best care to her husband who has had two kidney transplants, and built him a house in Danao which he considers best place for his rehabilitation. She has raised her three children with strong values in life. Her oldest is daughter Lucia, the middle is Robert who are both on their own now. The youngest is Jun who is still home with Noemi and Herbert as a full time student taking Law courses. Robert is serving the Military in the Air Force and has dual citizenship. Noemi has been consistent as a generous provider of her family in the Philippines as well as her own three children in Switzerland. She has worked hard to be able to send her children to the best school, and invested for their future. She has advanced herself in Switzerland by taking comprehensive lesson in the German language and learning the trade of Heart Valve production and now is a trainer. Noemi has made a booking to visit us here in California from Dec 13 to Dec 29, and will spend the New Year with her husband and two beautiful children one of whom (Lucijah or Lucia) we saw perform professionally and gracefully the Belly Dance at the welcome-luncheon at Mayor Boy and Tita Durano’s home and Balik Danao Night. Earlier we have reported here that our very own former DAUSA Vice Priesent Candy Canga-Picar was selected as one of 5 finalists among 100’s in the 2009 California Nurseweek Nursing Excellence Awards which made not only Danawanons but also the entire Filipino nursing community all over U.S. very proud. 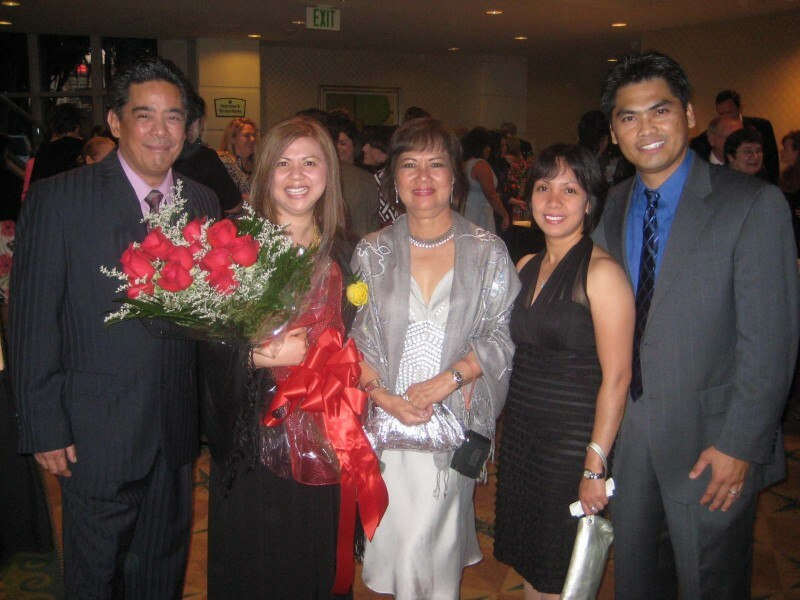 At the Awards gala which held on Friday,September 25, 2009 at the Hyatt Regency Orange County in Garden Grove,CA, Candy was decared winner in the Management category and will be California’s bet in the National level. “It is with much enthusiasm that I share with you that our Nurseweek finalist, Candy Canga-Picar, RN, was announced the winner in the Management category during the September 25th awards ceremony held in Garden Grove. According to Ms. Judee Berg, Nurseweek Vice President of Nursing Communications and Initiatives, “hundreds of nominations were submitted”. The nominations are then forwarded to the selection committee, blinded of any names, locations and identifiers, enabling an unbiased review and selection of candidates based on the merits of their individual accomplishments. Candy’s accomplishments, which undoubtedly influenced her selection, include her 99th percentile ranking in patient satisfaction, placing the Surgical Department in eighth place nationwide; the 86th percentile ranking in staff satisfaction; and her overall ability to mobilize her staff to affect positive changes, whether it be in service, quality, people or finance. Candy is Memorial Medical Center’s ninth Nurseweek nominee selected to be a Nurseweek Excellence finalist. This is an outstanding record, given the fact that 2009’s event was Nurseweek’s tenth Excellence Award ceremony. Our nursing leadership team strongly believes that this remarkable accomplishment would not be possible without the tremendous collaboration among all departments that support nursing activity every day. We are all proud of Candy’s achievements and this wonderful recognition she has obtained, not only for herself, but for the entire Memorial Medical Center.